We’d love your help. Let us know what’s wrong with this preview of I Protest! by David Douglas Duncan. To ask other readers questions about I Protest!, please sign up. Be the first to ask a question about I Protest! This is basically a book of b&w photographs taken at Khe Sanh, Vietnam during a period of eight days in February of 1968. It includes a textual critique of the war by the author, a very prominent war photographer of the time. For around six months in 1968, U. S. Marines were pounded by North Vietnamese forces at Khe Sanh in the highlands of South Vietnam during the American War in a near re-creation of the battle of Dien Bien Phu which resulted in the French withdrawal from Indochina. Photojournalist David Douglas Duncan, already famous for his combat photography in the Korean War, was “embedded” (to use our modern term) with the 26th Marine Regiment during a period of horrific fighting. Protest! : Khe Sanh, Vietnam For around six months in 1968, U. S. Marines were pounded by North Vietnamese forces at Khe Sanh in the highlands of South Vietnam during the American War in a near re-creation of the battle of Dien Bien Phu which resulted in the French withdrawal from Indochina. Photojournalist David Douglas Duncan, already famous for his combat photography in the Korean War, was “embedded” (to use our modern term) with the 26th Marine Regiment during a period of horrific fighting. Protest! : Khe Sanh, Vietnam is Duncan’s reaction in words & images to the fiasco. In a nutshell, Duncan was disgusted by the contrast in the political pronouncements of American leaders versus the situation on the ground. Duncan saw clearly that “The concept of hanging American prestige and honor and military valor on the defense of Khe Sanh is sad indeed.” “Sad,” not just for the Khe Sanh valley occupied by the Marines but for the entire conflict as well. The images accompanying the essay are relatively unique in published war coverage. Duncan was present for a week of the fighting and I Protest! includes perhaps a couple of hundred photographs. A good photo essay in Life at the time would have presented maybe a dozen images. So this publication conveys a more thorough visual description than much of what we saw at the time in the U. S. press. No captions accompany the photographs. This seems unfortunate now; but perfectly understandable given the purpose of the publication. 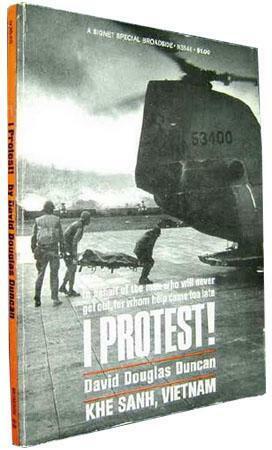 DDD was one of the first foreign correspondents to recognize the futility of the American War in Vietnam and this publication, rushed into print just weeks after Duncan left the battlefield, is his impassioned attempt to raise his voice against a war fought for no other reasons than to satisfy the egos of American political leaders.